I am at the ancient Kelaniya Raja Maha Viharaya in Sri Lanka. I have come to this sacred Buddhist place seeking some sorely needed serenity. In a great hallway there, I see once again a painting ” a panel of paintings ” that tells a familiar story of brutal intolerance. It shows an army of Portuguese soldiers destroying this very temple. In fact, they did set fire to this sacred place and partially destroyed it. They also confiscated the temple, banning Buddhists from entering the precincts. Later, the Buddhists reclaimed and rebuilt the temple 200 years later under the auspices of King Kirti Sri Rajasinghe. But the stark reminder of historic injustice and intolerance on the wall made my eyes mist over. And it kindled deep within me a spark of outrage, for it dawned on me, as clear as the blue sky outside, that nothing much had changed in our world; the same mindset that drove those long-dead Portuguese aggressors still fuels today’s oppressive trespassers. So in a tea shop with a view of this achingly beautiful temple ” a sacred temple my people had built over 2300 years ago years ago in honor of their Beloved Master, a temple which had withstood much tribulations ” I began to sketch this essay. Evangelists belong to a long line of pests from the West who have come and keep coming like locusts to colonize our souls and cannibalize our cultures. I have in mind the whole bandwagon: Mormons who hunt in pairs, Jehovah’s Witnesses, Baptists, Anabaptists, Church of This and the Church of That, well-heeled evangelists of a mind-boggling array of corny creeds and cults, all of whom, in slick American style, are engaged in aggressive marketing and PR campaigns to boost their ranks and their coffers with suckers from the East. Of course, they command the money, the power and the technologies to back their campaigns, their fishing missions. The main entranceway to the magnificent Kelaniya Raja Maha Viharaya. It’s construction is credited to Prince Uttiya, brother of King Devanmpiyatissa. Buddhism was introduced to Sri Lanka during this monarch’s reign, in 306 BCE to be precise. The latest incursions are merely a continuation of the 500-year-old sorry saga of Asia, Africa and South America, which began with the arrival of the Portuguese and the Spaniards. Some have never recovered from the machinations of their priests and the savagery of their conquistadors. The baton of imperialism has passed from the Europeans to the Americans. That is not to say that the rest of the West has dropped out. They have not. They are very much in the game. It’s just that the Americans are in the lead, the new Romans on the rampage. The old tricks still work. Priests from the West come to the East. They tell the natives that good things will happen now and in the afterlife if only they accept their blond, blue-eyed god as their savior. Otherwise, the prospects would be dreadful. An image of Gautama Buddha. Sri Lanka is the world’s oldest, and continuous Buddhist country. So we shut our eyes tight, clutch our bibles tighter and we pray. When we open our eyes, we have the bibles, while the canny comforters and their kind have our land, our blind allegiance and even our pennies, which can multiply into a tidy sum for the ‘spiritual’ cartel. Carrots and sticks. Time-tested tricks. We know well how the Europeans won the West. They won it through mass genocide of the native populations in North and South America. In South America, hundreds and thousands of natives who resisted conversion were garroted. There is a poignant painting depicting such conversions. It shows armored Spanish soldiers garroting native priests, while a Spanish priest holds up a large cross. More terrified natives await their turn. On the side, another Spanish priest feeds stacks of ancient gold-leaf books of the Mayans into a fire. On the face of the Mayan priests, a look of utter sadness mixed with resignation. The cruelty of the Christians when converting the natives of places like Sri Lanka, India and the Philippines is well documented, but I can offer just a small sample here. Even if in less barbaric form, this was the agenda of the later colonial masters from Europe ” the Dutch and the British. When people adopt an alien religion, it is not just a religion they adopt, but an alien way of life. Such people celebrate not so much local traditions, but the festivals and high points of Jews, Christians and Arabs and whichever colonial master they had. One of the most beautiful Buddhist temples in the world, the Kelaniya Temple epitomizes refined Sinhala esthetics. 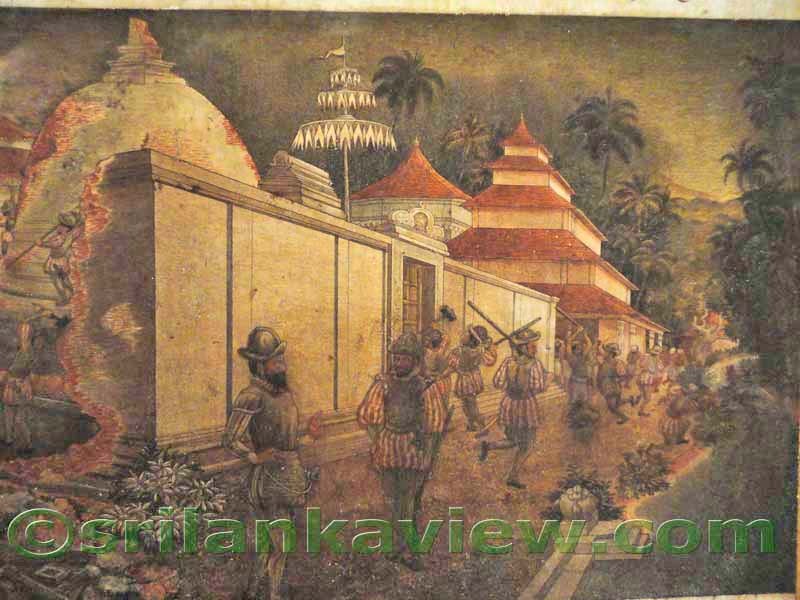 Buddhism fashioned the culture of the Sinhala. This Path — from which the Sinhala have derived their spiritual sustenance — is intrinsic to their heritage. In his masterly travelogue, Among the Believers ” An Islamic Journey, V S Naipaul shares his intimate insight into the ways an alien religion destroyed indigenous cultures. This is an extract from a speech he gave in 1990. Listen to Naipaul. “Because I was soon to discover that no colonization had been so thorough as the colonization that had come with the Arab faith. Colonized or defeated peoples can begin to distrust themselves. In the Muslim countries I am talking about, this distrust had all the force of religion. It was an article of the Arab faith that everything before the faith was wrong, misguided, heretical; there was no room in the heart or mind of these believers for their pre-Mohammedan past. So ideas of history here were quite different from ideas of history elsewhere; there was no wish here to go back as far as possible into the past and to learn as much as possible about the past. Naipaul describes the effects well. Christianity and Islam are just two sides of the same intolerant coin. Their Buffalo Bills and their Wild Bills, their Custers and their Cortezes, and the long line of predators and priests made sure that the sorry remainder of once-proud nations would remain so, while they ruled the roost in lands drenched with native blood. Many weaker cultures succumbed to the relentless onslaught from the West. They either slaughtered those who resisted or they sowed the seeds of abjection and their eventual self-destruction. Even today, we see the pathetic dregs of once-noble nations staggering around native reservations and barrios in North and South America, in Australia, in Canada, in New Zealand. They have lost their spirit. They have lost their will to live. They seem embarrassed to be alive. They are self-destructing. At best, they are performing monkeys titillating whites with a thirst for the exotic. These are abject peoples, vanishing tribes. Now, not satisfied with ruling their large chunk of raided real estate, they are hell-bent on extending their hegemony over the whole world. Not even a little island nation in the Indian Ocean escapes their radar, a radar scanning new territories for economic, cultural and spiritual colonization. They howl in protest when the natives resist. But it’s very easy to substantiate the nefarious activities of their ilk. Still, in the interests of space and time, I do not intend to cite the corpus of studies which prove beyond doubt the devastation that has been wreaked on various peoples and cultures by the religious agents of Western imperialism ” an arrogant and ruthless enterprise fueled by religion, money and armed might, the unholy trinity of neo-imperialism. Human misery is happy hunting grounds for the spiritual cartels. It has always been so. They strike when their targets are at their weakest or bomb them to submission to make sure they are at their weakest. Thus softened up, they are susceptible to inducements and brainwashing. 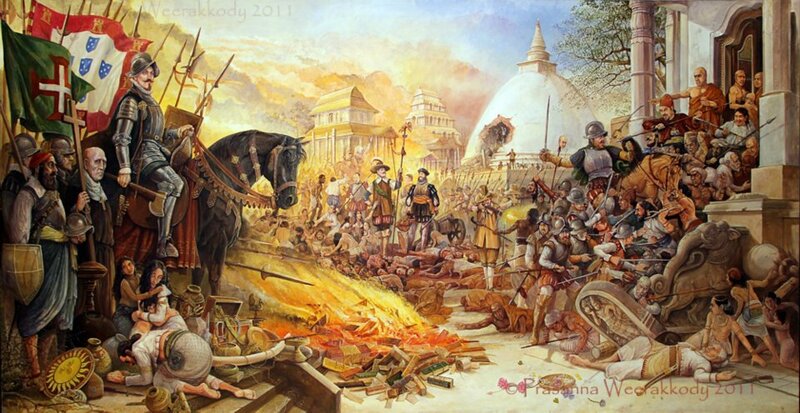 In the 16th Century, the great Kelaniya temple was set ablaze by Portuguese soldados, partially destroying it. Later, the Lankans repaired the damage. They have many tried and tested weapons in their arsenal. They are canny. To ‘convert’ people, you must first make them despise and reject what had sustained their people for millennia. So they vilify their faith or convince them it is a spent force or dark superstition. In so doing, they make us spit on our heritage. You can read more about the Buddha Biscuit and religious conversion techniques in South Asia here. Then as now, rare is the native who can resist such marvelous baubles. Make the bait juicy. Dazzle the natives with their power and glory. Pile on the questionable comforts of the religions they are peddling, and reel them in, easy as you please. Add another zombie to the roster. Check! This is cruel. This is unacceptable. But protest and you are sure to invite a howl of counter protest accusing you of suppressing freedom ” freedom to engage in their agenda. Western religious intruders are, in every sense, Trojan horses, the Fifth Column, which the dictionary defines as “A subversive group that supports the enemy and engages in espionage or sabotage; an enemy in your midst.” In the imperial enterprise, the priests always went in first, then followed the firepower. They may use foreign and local agents, but their controllers are megalomaniac Westerners, the powers behind most of the ‘churches’ selling pieces of blue sky to natives. We welcome them to our lands and accept their gifts at grave risk. For once they are in, once they gain a foothold, they will demolish our unity and integrity, which is tantamount to annihilating our culture. Then we are one step closer to extinction. The self-righteous mob on fishy fishing missions fishing in troubled waters should know that Asian civilizations were established on, and sustained by, the finest and wisest spiritual and moral foundations this planet has ever known. Although colonizers from the West have tried for five centuries to colonize our souls, make us ape them and adopt their delusions, many of us have resisted, while some of us, of course, succumbed to inducements and spiritual seduction. It’s too late to do anything about that now and I mean no offense to any Asian who worships the gods of the conquerors. I wish them well. We believe it’s worth preserving the unique, beautiful and, yes, great civilizations that flourished in Asia. I don’t mean we should try to hang on to the past and reject modernity; that would be primitivism, guaranteed fossilization. That’s not what I’m promoting. Besides, that would be impossible, for cultures are not static; they are dynamic; they change; they adapt; they move on. I mean it’s worth preserving the quintessence of our cultures, for example, the way Thailand and Japan have done. They did that, to a large extent, by successfully repelling European priests ” the Fifth Column I referred to earlier ” from gaining a foothold in their homelands. Unfortunately, the rest of Asia was not so savvy. By the time they opened their eyes, the natives had the Bibles and the interlopers had their lands. I believe we owe our future generations. It would be a pity if they can have a glimpse only in museums of the by then long dead cultures, the great cultures that had sustained their ancestors. I believe it is worth fighting for, as did our ancestors who fought against tremendous odds. (Admittedly, some of our ancestors sold out.) For that, we must be vigilant. For that, we must be courageous. For that, we should not allow alien cultures to colonize our souls. For that, we must resist bribes and brainwashing. We know we are struggling against an enemy immensely more powerful than we are. But we must resist at all costs. In this do-or-die struggle to preserve our way of life and our spirit, we can take courage from the lessons of history. Where is the mighty Roman Empire whose dominion extended from remote Britain to the Middle East? Where is the British Empire where the sun once never set? Where today is the Soviet empire? Gone, vanished. When the founding pillars of a people ” religion, language and culture, all inextricably linked ” are undermined, neither a nation nor a civilization can survive intact for long. Those who engage in such willful, relentless destabilization are engaged in emotional violence, psychological warfare. They traumatize and balkanize nations, set son against father, husband against wife, neighbor against neighbor, group against group, fermenting crisis and conflict, which will eventually lead to their destabilization and disintegration. Then they are soft targets for takeover. Island Newspaper, March 8, 2000. Reproduced in? Christian Aggression.org. 4. 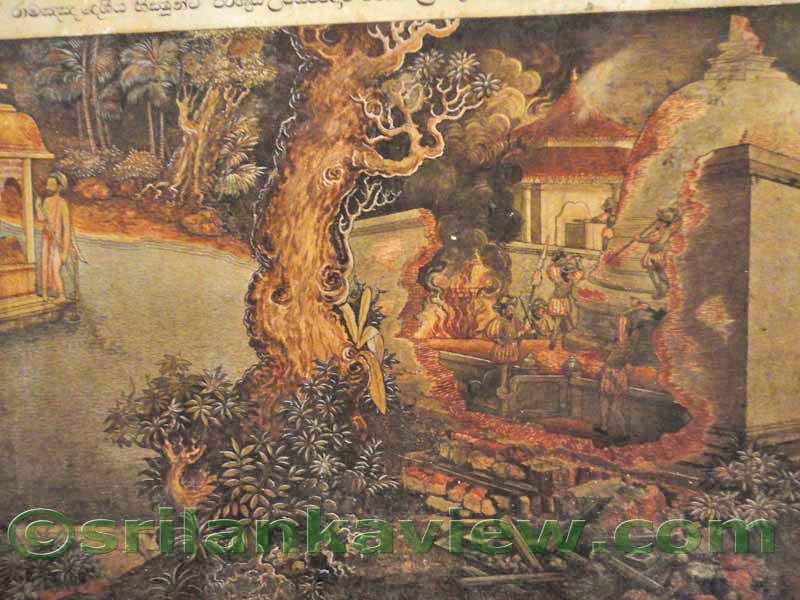 Senaka Weeraratna, Repression of Buddhism in Sri Lanka by the Portuguese. (Abridged version). 5. V S Naipaul, Our Universal Civilization,City Journal, 1991. Sesha Samarajiwa is interested examining foreign religious agents’ role as Fifth Columnists of neocolonialism/neoimperialism. Recently I had a phone conversation with a dear American friend of mine. He and his wife are devout Christians and they belong to a particular sect of Christianity. My conversation started on the geopolitics of the world and as I talked to him he introduced the Christian God into the picture. I have no problem with his belief but I did find this subtle change of subject from geopolitics to religion a bit unsettling. By now he was in command of the conversation as we debated the pros and cons of Christianity. In the process of this conversation I was led to believe only his sect of Christianity is valid and all other sects of Christianity are wrong in one way or the other. The concept of the Catholic church bordered on blasphemy to him. Being a good debater I used every method of logic to point out that his stand is that of pride and arrogance for he is quick to condemn not only all other faiths but also all other Christian sects as blasphemes. During the debate over the phone he stated that if any faith has even one percent that is wrong then the 99% that is right is of no relevance, thereby insinuating his concept of Christianity is without flaw and cannot be debated. I questioned him what if he were to have a Buddhist or a Hindu go to his house and preach to him their doctrines. Would he dismiss them as “pagan sinners” who should embrace HIS version of Christianity? he fell silent on this question. During the debate what entered my mind was it is people like him in the past who would take a passage from the Bible as he was doing throughout the debate, to support their belief that all other faiths are wrong. These Christians do not need to read the holy books of other faiths and come to the conclusion that all religions have plenty in common than what separates them. For example all religions do consider killing and lying to be either sins or wrong behavior. It dawned on me that my friend as descent a man as he is, is the 21st century version of those Christian marauders who invaded my father land of Sri Lanka and vandalized the religion not because they found the Buddhist teachings wrong but because a passage in the Bible told them it was wrong. I was able to point to my friend that if he will not even take the time to read a bit of the holy books of other faiths and simply reach for a passage in the Bible to condemn them that is an act of pre judging other faiths or prejudice against them. I also pointed that other faiths do the same to Christian beliefs. The Christian missionaries were propagating the religion through the pamphlets and the books. Rev. D.J. Gogerly of the Wesleyan mission published Christian Pragnapthi in 1849. Gunananda thera replied with Durlabdi Vinodini in 1862 for Buddhists. Hikkaduwe Sumangala thera wrote Christiani Vada Mardanaya and Samyak Darshanaya in 1862-63. Soon after, publications were replaced by public debates. The Baddegama debate originated from an argument arising between a young monk named Sumangala and a Christian priest in the temple of Baddegama. Gunananda Thera and many other monks including Bulatgama Dhammalankara, Sri Sumanatissa, Kahawe Nanananda, Hikkaduwe Sumangala, Weligama Sri Sumangala, Pothuwila Gunaratana participated in the debate. The debate was not held face-to-face. This is because if the manner of the behavior of the Christian debaters had led to conflicts, the Buddhists, as the majority, would naturally be blamed. Considering the situation the two parties agreed to carry out the debate in writing. Originally the text were composed in Baddegama, though later writings were carried out in Galle. The Waragoda debate was also held in 1865. A third debate was conducted in Udanwita in Hathara korele present day Kegalle District. The Creator, the redeemer and the Eternal heaven were the debating topics. The debate was carried out in 1 February 1866. John Edwards Hunupola (Hunupola nilame)represented the Christian side; he was a former Buddhist monk and Christian convert. As agreed before the debate Gunananda Thera published the summary of the debate. In response Hunupola Nilame also published his own version of a summary. Gunananda Thera issued more publications to counter the Hunupola nilame’s summary. There are no records of the Liyanagemulla debate, the only known fact being that it was held in 1866. As the intensity of the debate rose in Buddhist side and Christian side, both parties agreed to debate in Gampola on June 9 and 10 of 1871. Gunananda Thera displayed his oratory skills in this debate and in appreciation the crowd cried in joy and thereafter paraded Gunananda Thera around the Gampola town. After the Thera delivered several sermons at various places in Gampola, people arranged a procession, taking the Thera to the Peradeniya railway station and sending him back to Colombo. There people collected the sum of £75.00 to print the sermons the thera had delivered. All these debates culminated in the most notable of all debates, the Panadura debate, two years after the Gampola debate in 1873. The cause for debate arose when Rev. David de Silva delivered a sermon on the Soul at the Wesleyan Chapel, Panadura in 12 June 1873. Gunananda thera delivered a sermon a week later criticising the points raised by Rev. David de Silva. The two parties signed an agreement on 24 July 1873 to hold another debate at Panadura, although this was not the only cause of the debate as debating on religious issues had commenced more than 10 years previously. The Christians may have thought that the Buddhists were not educated and hence could be easily defeated in debate. But this could be described as a miscalculation on the part of Christians. The Buddhist monks were familiar with Pali and Sanskrit texts like Nyaya Bindu written by Dignāga and Tarka sastra by Dharmakirti, which were written on art of debating, and were not hesitant in accepting the challenge of debating in public. Rev. David de Silva, a fluent speaker in Pali and Sanskrit addressed the audience of around 6000-7000 – but only a very few understood him. In complete contrast was Mohottiwatte Gunananda Thera who used plain language to counter the arguments of his opponents. Dr. Vijaya Samaraweera in his article “The Government and Religion: Problems and Policies c1832 to c1910”, stated; The Rev. Migettuwatte Gunananda proved himself to be a debater of very high order, mettlesome, witty and eloquent, if not especially erudite. The emotions generated by this debate and the impact of Migettuwatte Gunananda’s personality had lasting effects on the next generation of Buddhist activities. Migettuwatte Gunananda’s triumph at Panadura set the seal on a decade of quiet recovery of Buddhist confidence. In retrospect the establishment of the ‘Society for the Propagation of Buddhism’ at Kotahena, and the Lankaprakara Press at Galle would seem to mark the first positive phase in this recovery. At the end of the second day of the debate the jubilant crowd uttered “sadhu, sadhu”. The Christians were not pleased the noise the Buddhists audience were making. When atmosphere became heated Migettuwatte Gunananda thera raised his voice and ordered “everybody should be silent”. After that remark the crowd were dispersed without making any further scenarios. “	the most brilliant Polemic Orator of the Island, the terror of the missionaries, with a very intellectual head, most brilliant and powerful champion of the Sinhalese Buddhism. Rev. S. Langden, who was present when the Thera spoke in the Panadura debate remarked; There is that in his manner as he rises to speak which puts one in mind of some orators at home. He showed a consciousness of power with the people. His voice is of great compass and he has a clear ring above it. His action is good and the long yellow robe thrown over one shoulder helps to make it impressive. His power of persuasion, shows him to be a born orator. UNHRC is NOT about human rights. It is about INTERNATIONAL POLITICS. With due respect to your feelings of patriotism, I must ask whether we are better off today. In 1958, the chief prelate of Kelaniya temple plotted with others and killed one of our best PMs. Now the custodians have allowed a famous minister to run riot in the area. Are we not going back to the stone age under our own control?. At the rate things are deteriorating there will not be any Buddhism left in SL soon. This entry was posted on Saturday, March 8th, 2014. You can follow any responses to this entry through the RSS 2.0 feed. You can skip to the end and leave a response.